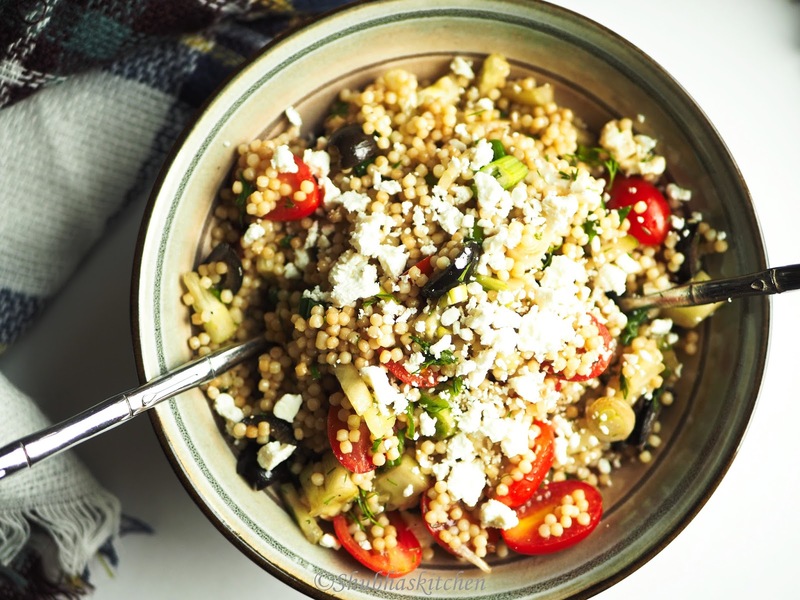 Today, I will be sharing with you all a delicious Couscous salad. 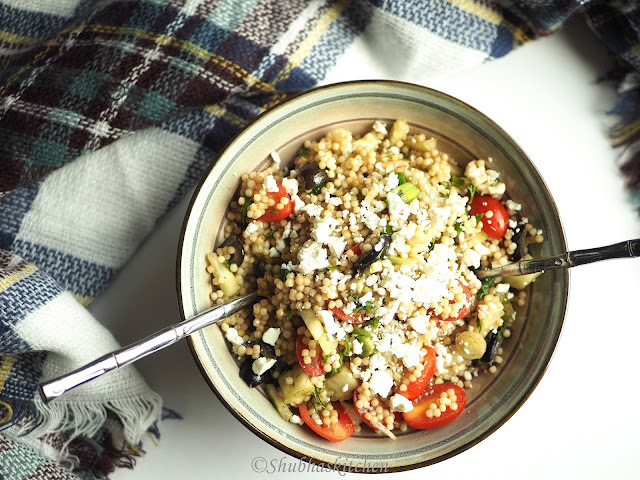 This salad is usually prepared with Israeli couscous but I will be using a substitute that is cheaper and easily available than the traditional couscous. 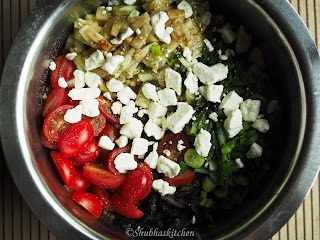 This salad is refreshing, flavorful and makes a great meal. The substitute that I used is "acini di pepe". 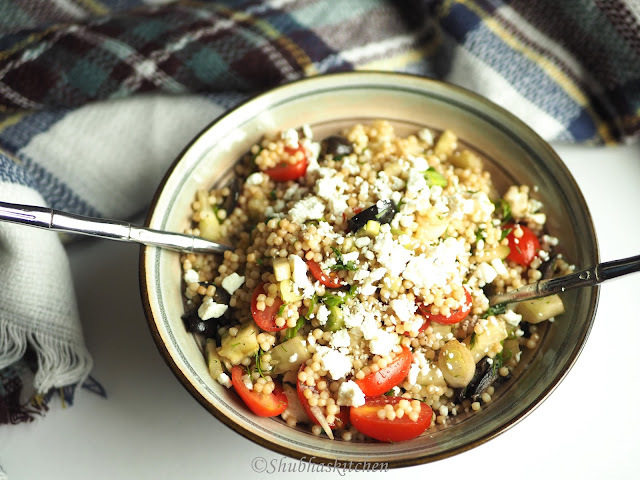 Acini di pepe is a pearl pasta that looks very similar to Israeli couscous. 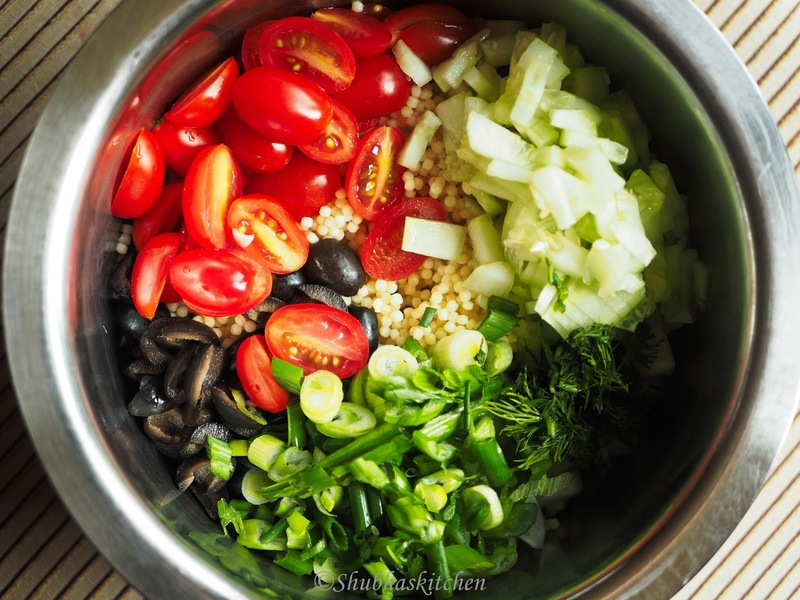 During a recent dinner at my friend's house, she made a couscous salad. As with all the food she prepares, this salad was delicious. Since I had never purchased couscous before hence asked her which brand would be the one to purchase and where she bought them. That's when she showed me this box of "acini di pepe". Acini di pepe is easily available in the pasta aisle in most grocery stores. Later, I did some research on Israeli couscous and Acini di pepe . I soon realised that Acini di pepe is often used in place of the Israeli couscous. The cooking method is different in both the cases. Acini de pepe is a pasta and hence is cooked like other pastas. One cup acini de pepe need about 8 cups of water to cooked. 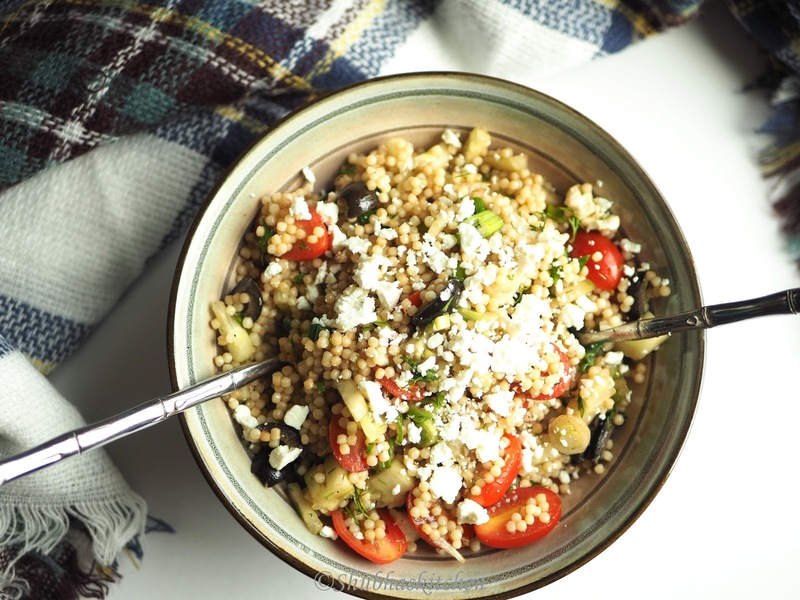 Once cooked , the water is drained.When it comes to Israeli couscous, it cannot be cooked like other pastas. 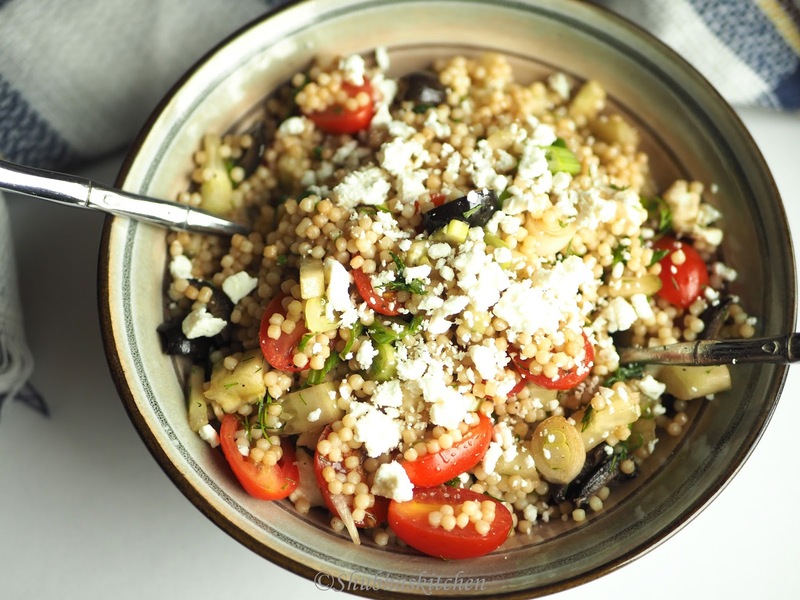 Unlike Pasta, couscous is not kneaded which means that the gluten is not released. That is the reason why pasta needs a lot of water for cooking. Israeli couscous on the other hand is toasted slightly in little oil . The toasted couscous is then sprinkled to boiling water (1 cup of couscous needs 1 1/4 cup of water). The pot is then removed from heat and set aside covered for 5-6 minutes.Couscous absorbs all the water.Later, the couscous is gently fluffed using a fork to separate the grains. So, as you can see the method to prepare couscous and acini di pepe is very different. Chop the olive into 4 parts . Chop the cherry tomatoes into halves. Bring 8 cups of water to a boil . Add the acini di pepe and some salt. Cook until done. Drain and let it cool. If using Israeli couscous, then cook as per the instructions on the packet. 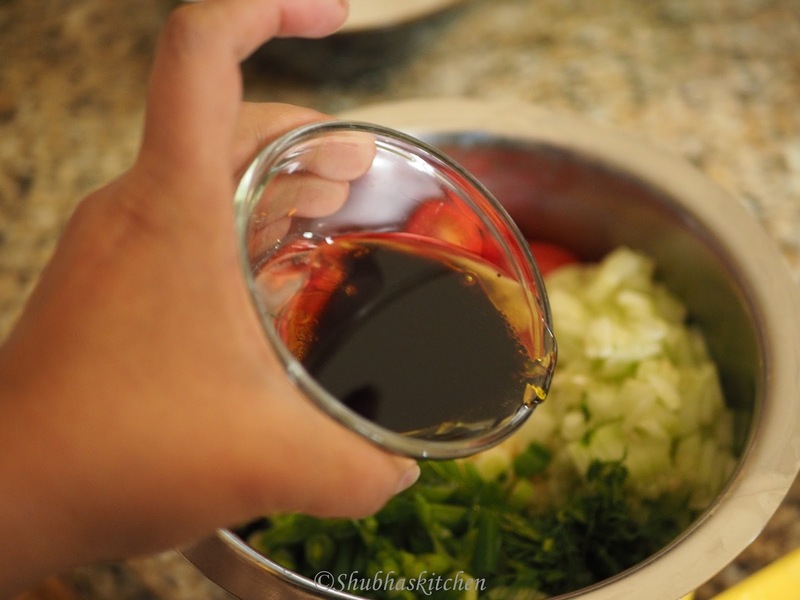 Prepare the dressing by mixing olive oil and balsamic vinegar. In a big mixing bowl, add all the veggies, acini di pepe, salt and pepper. Add the dressing and gently toss the ingredients. Lastly add the feta cheese and serve. This salad makes for a great cold salad. Remember to add the feta cheese just before serving. Colourfully healthy😜. 2 items are not in my pantry now. Will have to remember names and buy when I do shopping next. So included in the “to buy list”.